Arrive at Chennai and transferred to the hotel. Proceed for the sightseeing tour of Chennai. Visit the National Art Gallery and Museum with a fine collection of ancient paintings of almost all schools, Fort St. George, St. Mary's Church, Marina Beach (the second longest in the world), San Thome Cathedral and Mylapore Shiva Temple. Rest of the day free to enjoy you-self, overnight stay at Chennai hotel. After breakfast drive to Mahalbalipuram and enroute visit the Kanchipuram, the city of temples in Tamilnadu have more than 1000 temples. Visit Vaikuntaperumal temple, Ekambareeswarar and Varadarajar temple. The Kanchipuram is also famous for its silk sarees. Mahabalipuram, the only shore temple that has survived the ravages of time. The standing testimonial to the rock cut art. Overnight stay at Mahabalipuram hotel. After breakfast drive to Pondicherry , once a French colony and home to the Aurobindo Ashram and Auroville has become the seat of yoga and meditation. Visit Pondicherry Museum and sculpture gallery with an outstanding collection of artefacts. Relax at the beach in the evening. Overnight stay at Ponidicherry hotel. Morning after breakfast drive to Tanjore awaits you with its rich architecture, exquisite handicrafts, paintings, bronzes and South Indian Musical instruments. The tourist places in Tanjore are Brahadeeswara temple, the second largest monolithic sculpture, Nandi (Bull), the Royal palace complex, which houses library and museums. Overnight stay at Tanjore hotel. Morning after breakfast drive to Trichy, the citadel of the Chola dynasty in the medieval period. See the Lord Robert Clive's house, Srirangam temple, Rock-Fort temple, Ganapati temple on hilltop and Shiva temple. Overnight stay at Trichy hotel. 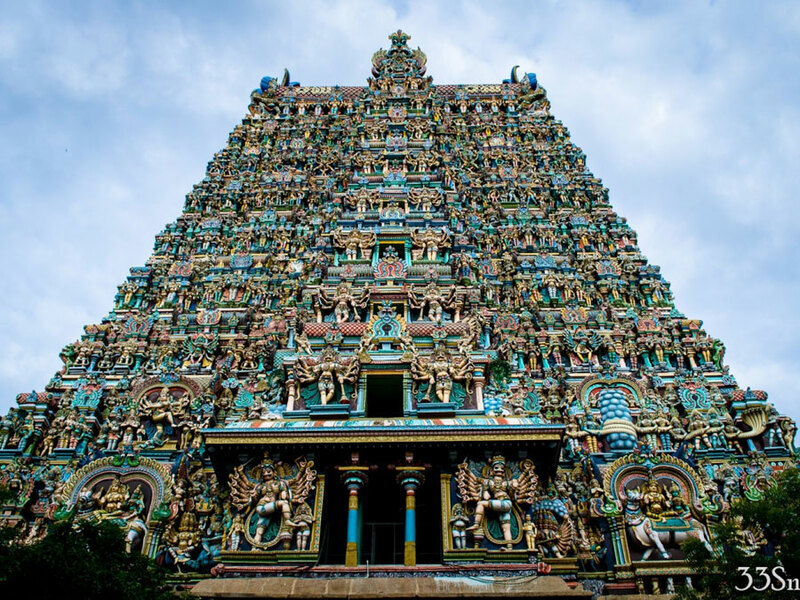 After breakfast drive to Madurai , known for 1000-pillared Meenakshiamman temple. You are also taken to the special religious night ceremony held in the temple. Also visit Thirumalai Nayak's Palace and Gandhi Museum . Overnight stay at Madurai hotel. After breakfast drive to Periyar Wildlife Sanctuary, one of the best game sanctuaries in India . Also cover Thekkady enroute visiting all important tourist places. Enjoy boating on the Lake Periyar top explore the sanctuary at its best. Drive past the spice plantations like cardamom, cinnamon, pepper, coffee and tea estates. You can shop at the local market. Overnight stay at Periyar hotel. 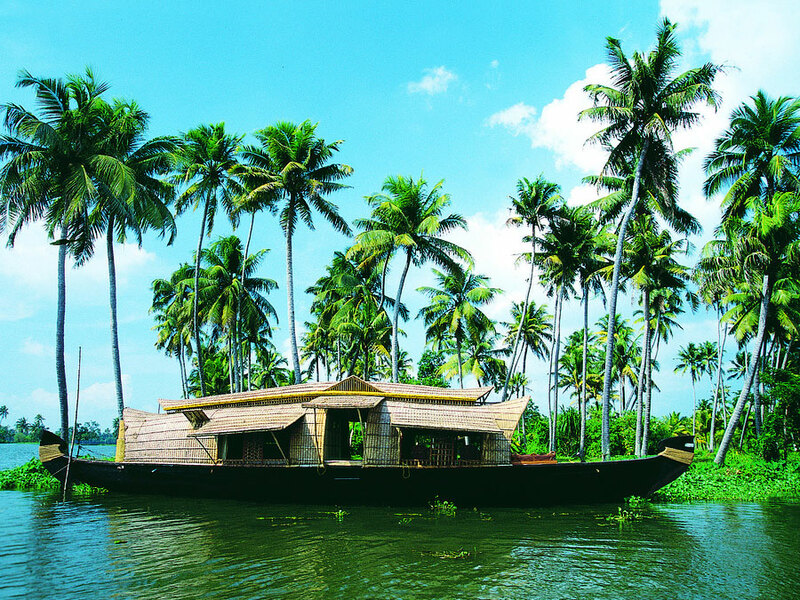 A cruise on the Vembanad Lake . Check into the backwater resort. Enjoy your day in swimming or for a massage. Visit the Kumarakom Bird Sanctuary with a variety of bird species. The breathtaking view of the lake during the dawn and dusk leaves you spellbound. Overnight stay at Kumarakom hotel. Morning after breakfast drive to Alleppey. 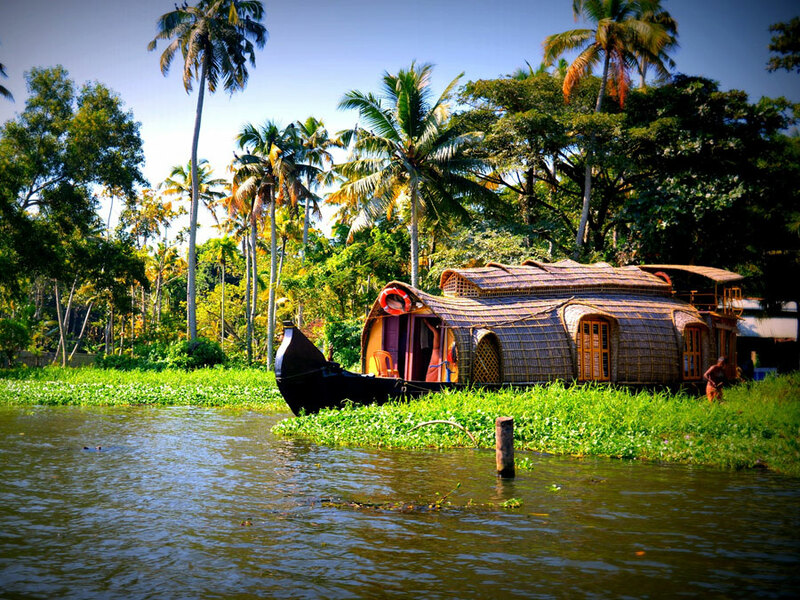 The backwater destination is famous for the snake boat racing events. Your day is free to relax at the backwater resort or proceed for a backwater cruise (Optional). Overnight stay at Houseboat. Early morning drive to Kochi , the commercial capital of Kerala. Vasco-da-Gama placed this spice centre and the natural harbour on the world map. The tourist places in the city include a Jewish synagogue - The Dutch Palace, Portuguese Churches , Mosques, Hindu temples and Chinese Fishing Nets. 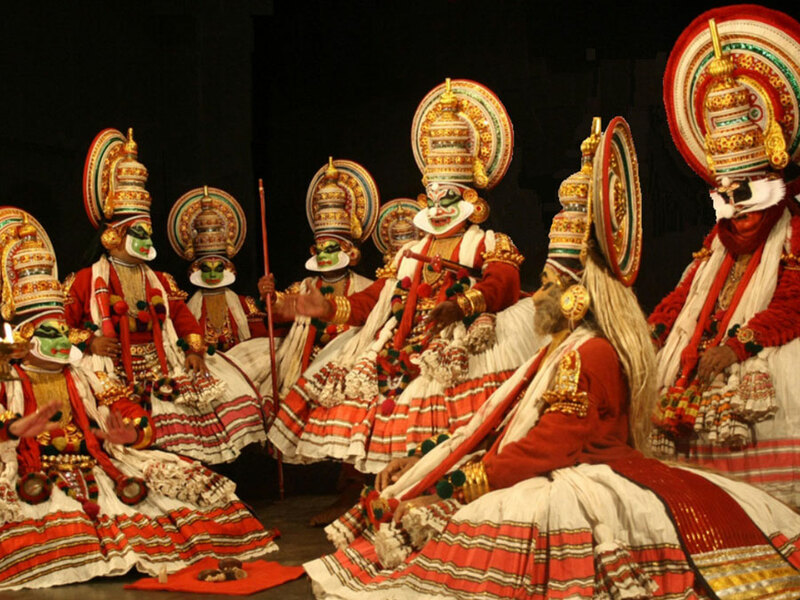 In the evening attend the traditional Kathakali Dance Show. Overnight stay at the hotel. Drive to Ooty - 'the queen of hill stations'. The beautiful hill station belongs to the 19th century. Overnight stay at the hotel. A full day excursion to Ooty and Coonoor. Visit Botanical Gardens, the Ooty Lake , Dodabetta peak offering you panoramic views of the Nilgiri Mountains in Ooty. 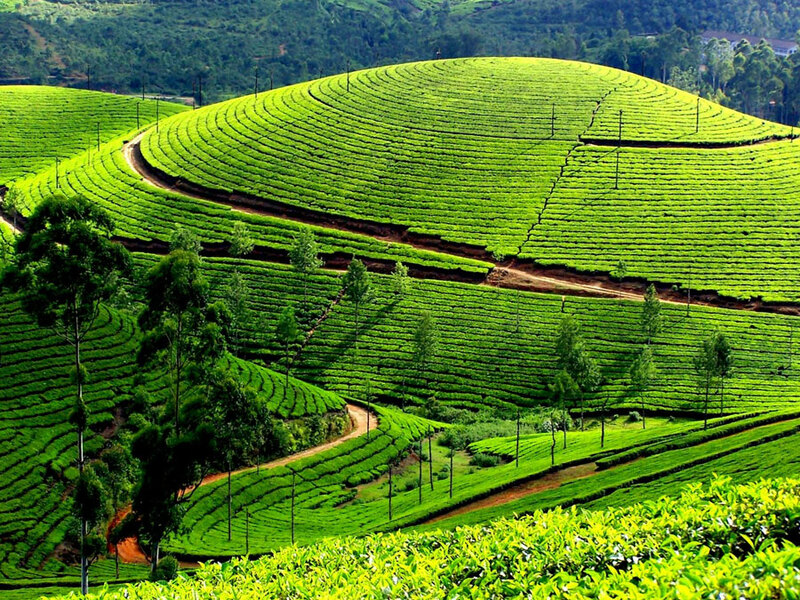 Coonoor is a popular hill resort where you can opt for a toy train tour to Coonoor to enjoy the scenic surroundings. Enjoy the tour to nearby tourist excursions. Overnight stay at Ooty. Reach Nagarhole National park near Mysore , which claims for large populations of tiger, leopard and elephant with over 250 species of birds. Visit the park by jeep, on elephant back and in a coracle. Stay two nights at the Kabini River Lodge on the banks of Kabini River . Stay at the Cauvery fishing camp on the banks of the Cauvery River at Bheemeshwari where you can try out Mahseer fishing (best season November to June). Overnight stay at the wildlife resort. After breakfast drive to Mysore , the Sandalwood City of India . The magnificent palaces, beautifully laid out gardens, huge buildings and ancient temples are the major attractions of the city. Also visit Mysore Palace , the Art Gallery , Brindavan Gardens etc. Overnight stay at Mysore hotel . Visit Srirangapatna - The capital of Tipu Sultan's empire. The huge fortress encloses a mosque. The Ranganatha Swamy temple, Tipu's Summer Palace known as the Daria Daulat Bagh, the Wellesley Bridge, Lal Bagh, the Botanical Gardens, Tipu's Summer Palace, Bull Temple and shopping at Arts & Crafts Centre Emporium at M.G.Road. Overnight stay at Bangalore . Depart for your onward destination or way back home from the Bangalore airport with unforgettable memories.